Mortal Kombat: Shaolin Monks is an action adventure beat-em-up fighting video game based on the Mortal Kombat series of fighting games. Shaolin Monks was developed by Midway Studios LA (formerly Paradox Development), Midway - San Diego, and Mortal Kombat Team - Chicago, and published by Midway Games for the PlayStation 2 and Xbox. It was released September 16, 2005 in the United States and September 30, 2005 in Europe for both platforms. The game centers on two members of the Shaolin Order, Liu Kang and Kung Lao, as they travel through the realms in an attempt to thwart Shang Tsung's plans to dominate Earthrealm. The player can control these two characters in either single mode or co-op mode as they venture through several environments fighting enemies. Despite being an adventure game the engine incorporates multiple elements from the Mortal Kombat series such as finishing moves and combos that can be upgraded. A versus mode also allows the players to fight against each other. Midway developed Mortal Kombat Shaolin Monks due to their desire to have an adventure game that would appeal to Mortal Kombat gamers. The game has sold over one million copies as of 2008 and it also received positive critical response. The game features three main modes of play. Aside from a single-player mode, the game has a co-operative mode, where two players can work together through the game, with access to some areas and items that are inaccessible in single-player mode. There is also a versus mode, where two players can fight against each other in some of the arenas featured in the game. In addition, players can play a shortened, censored demo version of The Suffering: Ties That Bind as well as an emulated arcade perfect version of Mortal Kombat II (which is taken from Midway Arcade Treasures 2). 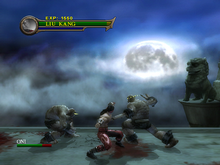 The game also includes Fatalities, a common feature of the Mortal Kombat series. Performing combos on enemies increases the Fatality meter. Once that meter has reached a certain level, a Fatality may be performed, regardless of an opponent's level of health. The main characters have the ability to perform several different Fatality moves, some of which are 3D updated versions of Fatalities from the first and second Mortal Kombat games. The player can also unlock the ability to do Multalities, which are Fatalities performed on multiple enemies at once. The concept of Brutalities from Ultimate Mortal Kombat 3/Mortal Kombat Trilogy has also been brought back, though with a different function. Once the move has been performed, the player will be able to give more devastating attacks for a limited time. In addition to Liu Kang and Kung Lao, the game features other characters from the Mortal Kombat series. Some are there to aid the main characters, including Raiden, Johnny Cage, Kitana, Sub-Zero and Jax while others serve as the game's bosses, including Mileena, Jade, Ermac, Reptile, Baraka, Goro, Scorpion, Kano, Shang Tsung, Kintaro and Shao Kahn. Other additional characters include Sonya Blade, Kabal, Noob Saibot, Smoke and Quan Chi. Tokens can be found throughout the game which will unlock some of these characters in versus modes. Scorpion and Sub-Zero are also unlockable playable characters in the game. Shaolin Monks spans the events of Mortal Kombat II, starting with the aftermath of the first Mortal Kombat. The battle rages furiously on Shang Tsung's island fortress in the Lost Sea, as the sorcerer watches the fighters battle his soldiers to protect Earthrealm. The Earthrealm's Shaolin monk Liu Kang defeats Shang Tsung, and the warrior Goro comes to his defense. With Goro distracting everyone else, Shang Tsung creates a portal to Outworld and retreats with his allies. Thunder god Raiden appears afterwards and warns the remaining fighters to get off the island palace because it is collapsing into the sea. Everyone, except Liu Kang and Kung Lao, evacuates and escape back to the Wu Shi Academy. Liu Kang and Kung Lao, however, have to fight their way to another portal to get to Wu Shi Academy. Upon arrival, Raiden awards his warriors for saving Earthrealm. However, Baraka and the Tarkatan attack the Wu Shi Academy. Although the Tarkatans are defeated, Baraka captures Sonya Blade. Raiden confirms that Shang Tsung is trying to lure Liu Kang and his allies to Outworld where he can order his henchmen to attack them and bide his time for power. If successful, Shang Tsung will conquer Earth without winning a Mortal Kombat tournament, which is cheating. Liu Kang and Kung Lao journey through the nightmarish realm of Outworld to stop the sorcerer's plot. They are guided by Raiden and assisted by Johnny Cage. Throughout their journeys, they meet several allies and learn of another person who wants Earth; the Emperor of Outworld, Shao Kahn. During their journey, all of Liu Kang's and Kung Lao's allies are captured. Once reaching Shao Kahn, Shang Tsung is revealed to have been impersonating Raiden on occasion in the pair's journey so that each of the soldier's defeats will enhance his powers enough to steal Shao Kahn's rule of Outworld. The two Shaolin Monks defeat Shang Tsung, and Kintaro and are challenged by Shao Kahn. With the real Raiden's help, Liu Kang and Kung Lao finish the Emperor and both are given the title of champions. With their friends and Outworld safe, Raiden's group returns to Earthrealm to celebrate their victory. But unbeknownst to the others, Quan Chi picks up his Amulet and manically laughs concluding the story. A spin-off game starring Liu Kang was originally supposed to be developed shortly after Mortal Kombat: Special Forces, the previous action-adventure title in the series in 2000, this however did not happen because of the departure of John Tobias and the very negative reception of Special Forces. In October 2004, the president of Midway Games, David F. Zucker, called the release of Shaolin Monks the "first step toward delivering something that Mortal Kombat fans have been calling for: a new game set in the Mortal Kombat universe every year." Producer Shaun Himmerick stated the team wanted to make a Mortal Kombat with a "deeper story." The team were fans of adventure games and decided to follow that direction. Mortal Kombat creator worked as the creative director for Shaolin Monks and joined the programmers from the team to make the fight engine. The team found a challenge in combining action elements with their multi-directional fighting engine, in an effort to avoid turning the game into a "button smasher". Their idea was to give the player more freedom to execute several moves together than any other adventure game. They would be able to attack in any direction they wanted. The team added multiple Mortal Kombat elements to the game to make the game more appealing. Since Mortal Kombat II was Ed Boon's favorite game in the series, the story of this spin-off was based on it. There was also a desire to include both Liu Kang and Kung Lao as protagonists with the latter having been introduced in Mortal Kombat II. The game's versus mode originated from a bug that allowed testers to face each other. Unlike in the typical Mortal Kombat games, the versus mode was made to include adventure games' elements. The engine is different from the one from Mortal Kombat Deception and was made to rival other adventure games. The co-op mode was made so that players would be able to work together to perform new moves and discover content that a single player cannot do. Originally, it was planned to allow more than two players in the co-op mode. While Dan Forden was the audio director, Jamie Christopherson worked as the composer. Mortal Kombat: Shaolin Monks has sold over one million copies and received mostly favorable reviews. At GameRankings, it holds an average of 79.10% and 80.64% for the PlayStation 2 and Xbox consoles respectively. The game was praised by critics for translating the franchise into an entertaining action game. The gameplay was noted for having the same movements from the classic Mortal Kombat games such as the Fatalities and the way combos are handled. The cooperative mode was distinguished for giving the players access to hidden bonuses but at the same time was criticized for being impossible to continue playing in a single player mode. It was one of the five games nominated by GameSpot for the title of Most Surprisingly Good Game of 2005. An advertisement for Shaolin Monks titled "Blood on the Carpet", created by the London-based Maverick Media, was condemned by the Advertising Standards Authority as condoning and glorifying violence. The commercial, "features a boardroom scene in which a Mr Linn, the mysterious trouble-shooter at a sales meeting, instructs two men to fight. Punches lead to a pen being stabbed into an arm; then a water jug is smashed over an executive's head – before his heart is ripped from his chest. Mr Linn concludes proceedings by decapitating another executive with his hat." The result of the complaint was, as quoted from the ASA report, "We told Midway not to repeat the approach and told them to consult CAP Copy Advice before producing future ads." A sequel focused on Scorpion and Sub-Zero, titled Mortal Kombat: Fire & Ice, was planned to be developed by Paradox but financial constraint caused the project's cancellation. Ed Boon recalled: "Monks was FAR and away the best spinoff. We were in talks to do a sequel before the Moorpark studio closed." A possible HD remake of Shaolin Monks was teased by Boon in October 2013. He also previously said they would "love to make one" someday, but a remake would not come "in the NEAR future" (from January 2013). In 2014, he also disclosed that they already did talk "about doing an up-rez'ed version for [the] PS3 and 360 a few years ago." ^ "Mortal Kombat: Shaolin Monks Goes Gold". Retrieved 2009-11-23. ^ a b c d e Berardin, César A. (January 13, 2005). "Mortal Kombat: Shaolin Monks Interview". TeamXbox. Archived from the original on February 11, 2011. Retrieved March 17, 2013. ^ Thorsen, Tor (October 22, 2004). "Midway announces Mortal Kombat: Shaolin Monks". Gamespot.com. Retrieved 2006-05-30. ^ a b Thorsen, Tor (August 17, 2005). "Mortal Kombat Shaolin Monks interview". GamesRadar. Retrieved March 17, 2013. ^ "Mortal Kombat: Shaolin Monks (2005)". Jamie Christopherson. Retrieved March 17, 2013. ^ a b "Game Rankings: Mortal Kombat: Shaolin Monks (Xbox)". GameRankings. Retrieved August 7, 2010. ^ a b "Game Rankings: Mortal Kombat: Shaolin Monks". GameRankings. Retrieved August 7, 2010. ^ a b Li, Richard (September 21, 2005). "1UP: Mortal Kombat: Shaolin Monks". 1UP.com. Archived from the original on January 5, 2010. Retrieved August 7, 2010. ^ a b Navarro, Alex (September 19, 2005). "GameSpot: Mortal Kombat: Shaolin Monks". GameSpot. Retrieved August 7, 2010. ^ a b Perry, Douglas C. (September 16, 2005). "IGN: Mortal Kombat: Shaolin Monks". IGN. Retrieved August 7, 2010. ^ Nardozzi, Dale (September 21, 2005). "TeamXbox: Mortal Kombat: Shaolin Monks". TeamXbox. Archived from the original on November 22, 2011. Retrieved August 7, 2010. ^ "Xplay review of MKSM". Archived from the original on 2006-08-13. Retrieved 2010-04-05. ^ "Mortal Kombat: Midway Delivers A Million Armageddons". Kotaku. 2007-01-08. Archived from the original on 2007-12-08. Retrieved 2008-12-03. ^ "Mortal Kombat viral ad glorified violence, says ASA". The Register. 2005-12-22. Retrieved 2009-09-08. ^ "Non-broadcast Adjudications". 2005-12-21. Archived from the original on 2008-03-26. Retrieved 2009-09-08. ^ Quillen, Dustin (December 7, 2010). "Mortal Kombat: Shaolin Monks Sequel Would Have United Scorpion and Sub-Zero". 1UP.com. Archived from the original on January 24, 2013. Retrieved March 17, 2013. ^ "Twitter / noobde: @matialderete I agree...Monks". Twitter.com. 2010-03-12. Retrieved 2014-03-19. ^ "Ed Boon teases Mortal Kombat: Shaolin Monks HD". Destructoid. Retrieved 2013-11-04. ^ "Is Mortal Kombat Shaolin Monks getting the HD treatment? - Mortal Kombat: Shaolin Monks for PS2 News". VideoGamer.com. 2013-10-31. Retrieved 2013-11-04. ^ "Twitter / noobde: RT @Shahil93 @noobde Shaolin". Twitter.com. 2013-10-07. Retrieved 2014-03-19. ^ "Twitter / noobde: RT @B_Nutter @noobde Any". Twitter.com. 2013-01-22. Retrieved 2014-03-19. ^ "Twitter / noobde: RT @WilliamnCourtne @noobde". Twitter.com. 2014-02-24. Retrieved 2014-03-19.